Availability: This product is discontinued and no longer available for purchase. For alternatives browse our Golf Trolleys department. 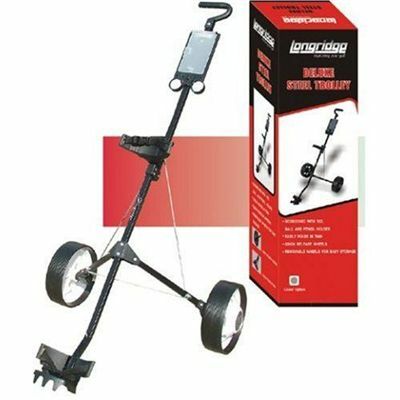 Deluxe Steel Golf Trolley - The Longridge Deluxe Steel Trolley is constructed from high quality steel and nylon components. The Anti Splay strengthening bars will ensure a long lasting durability season after season. Supplied with quick release wheels for easy storage and fitted with a scorecard/ball and tees holder as standard. for submitting product review about Deluxe Steel Golf Trolley.